​Many people dream of becoming a member of military personnel. Then there are folks who wish to make a career in hunting and shooting. Finally, you'll find individuals who love to hit their loved ones with a soft bullet in their free time. All of these individuals have some kind of shooting skills. However, some people are able to make their way in military or rifle sports. These folks spend hours in their backyard on shooting practice. If you want to make a career in any of these fields, you need a highly-rated airsoft rifle such as Well MB08 Bolt Action Airsoft Sniper Rifle with Scope and Bipod. Let's check its features and find out why this weapon is ideal for shooting practice. ​Well is a popular brand dedicated to providing top of the line air soft guns and rifles. The MB08 sniper is made even better with innovative additions. It features an exclusive folding stock that makes transportation of the weapon a breeze. The adjustable cheek pad as well as monopod at the base of the folding stock renders maximum stability to the weapon. The rifle includes an optic scope that rests on the top of a 20mm Picatinny rail. Although the rifle can shoot at a velocity of 450 FPS, its spring power source is fairly easy to pull back between your shots. If you wish to play the role of a sniper, get back into the shooting game with the MB08 sniper. The package is complete with a rifle, magazine, full metal barrel, folding stock, adjustable cheek pad, scope, adjustable hop-up, and a Picatinny accessory rail. ​Design - The MB08 sniper rifle is made to mimic an original weapon. The body is crafted with durable materials. Also, the feels and looks are just amazing as the built. In fact, the design of the weapon is its USP that entice shooting enthusiasts to make a purchase. ​Grip - One of the key features that distinguish this sophisticated sniper from other weapons is its ergonomic grip. It lets you hold the weapon without any sort of discomfort. With the handy, ergonomic grip, you can effortlessly aim and shoot desired targets. ​Safety - Many enthusiasts injure themselves in their backyard or shooting field. While it's okay to sustain minor injuries, certain injuries can be demanding and long-lasting. 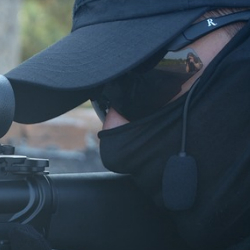 To avoid any instances of injuries, the MB08 sniper comes with enhanced safety features. The adjustable cheek pad and the adjustable hop-up render utmost safety to avoid possible injuries. ​Comfort - This wonderful sniper slides in your hands comfortably. The extra comfort level provided by the adjustable cheek pad and monopod at the stock base helps you to take much better shots. Consequently, you're sure to enrich your shooting abilities. ​Quality - The worth of an air soft rifle is largely determined by its quality. If the weapon is poorly made, you won't derive any shooting benefit. The makers of the MB08 have engineered this rifle to present one of a kind and quality rifle for shooters of all levels. - The worth of an air soft rifle is largely determined by its quality. If the weapon is poorly made, you won't derive any shooting benefit. The makers of the MB08 have engineered this rifle to present one of a kind and quality rifle for shooters of all levels. ​Durability - No one wants to buy a fragile weapon for shooting practice. Although many air soft weapons are marketed as durable pieces, most of them wear out quickly. The MB08 sniper, on the other hand, is built to last longer. Whether you use the rifle in your backyard or woods, the weapon will serve you longer without getting damages. ​Cleaning and maintenance - Cleaning and maintenance play an important part in increasing the life expectancy of the rifle. However, maintaining and cleaning any air soft rifle could be a costly affair. Additionally, you'll have to invest enough time on the upkeep of the weapon. The good news is the MB08 sniper is easy to clean and maintain. With a soft, damp cloth, you can clear any dirt and dust from the weapon. Also, little attention is needed on your part to sustain the rifle in good condition. ​Warranty - When it comes to buying air soft weapons, it's advised to check the warranty. That will let you replace or repair the gun or pistol in case anything goes wrong with the weapon within the warranty period. The MB08 sniper comes with a warranty period of 30 days. Within this period, you can seek repairs, servicing as well as replacement of the rifle. You may also get a refund in case you aren't content with your purchase. ​Usage - Obviously, you don't want to buy a gun that's difficult to use. That will only hamper your shooting experience. The MB08 is pretty easy to use and shoot. Whether you love targeting soft targets or hard ones, using this full metal barrel piece is easy. However, you need to get handy with the rifle in order to use it effortlessly. ​Pricing - Buying an air soft weapon that comes with a series of updated features and additions could be a costly proposition. However, you'll be surprised to know that the MB08 is priced in the modest range. There's no need for you to dent your budget to own this high-quality rifle. By expending a small sum, you can avail this highly-sophisticated weapon for enhancing your shooting abilities. ​Some shooters had issues with the usage of this amazing rifle. This is even more correct in the case of starters who're lifting the rifle for the first time. However, this is common with any other shooting rifle. You may get away with this issue with regular practice. After getting used to with the rifle, you can target objects like a pro. ​Shooting targets in the backyard for fun or rifle sports is something many individuals love to cherish. However, you need a top-rated weapon to sharpen your shooting traits in addition to determination and sincere efforts. This is where the Well MB08 Bolt Action Airsoft Sniper Rifle with Scope and Bipod comes into play to help out. Just go through the features of this popular rifle (mentioned above) in accordance with your shooting skills and requirements. Within no time, you can easily decide why choosing this wonderful rile is imperative for shooting practice.